With The Simpsons Movie only days away from your local theatre, The Simpsons marketing blitz is in full effect. 7-Elevens have become Kwik-e-Marts, Simpsonizeme.com is completely overloaded, a giant figure of Homer with a doughnut was painted on a Dorset hillside alongside the ancient 180-foot figure known as the Cerne Abbas Giant and there's a huge painted doughnut at the base of the CN Tower as I type this. This week, our yellow friends from Springfield are everywhere. As a fan of the series for over 17 years, I'd like to contribute to Simpsons-mania. In addition to my Homer Simpson Quote of the Week, which I've been updating every Saturday morning since August 8, 2003, here are my favourite Simpsons-related entries from the past five years. 9/11 - It took an episode of The Simpsons to truly bang home the impact of September 11, 2001. 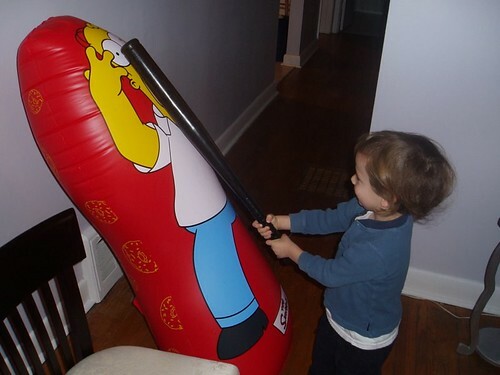 The Simpsons - My young son shares the love. Also read Prodigy. Why I Still Watch - In Homer I trust. Lisa On Ice - The episode that nearly destroyed me. A Streetcar Named Marge - Pulled from syndication following Hurricane Katrina. What Would Homer Do? - Words to live by. My Ten Favourite Episodes of The Simpsons - The list you know you want to read. 18 and Life - With apologies to Skid Row.